Do you ever find yourself wearing one item of clothing the same way, each and every time? Most of us find it difficult to create more than three looks with one top, skirt, dress, etc. So, I’ve put myself under the ultimate challenge to style five different looks, for five different occasions using one skirt. Not only will this maximise your style, this is a great pro tip for travelling that will save you space – no more overpacking! Who doesn’t like denim, suede and paisley? Whether you decide to rock heels or a pair of suede flat sandals, this look is perfect for a Sunday out, shopping or going for brunch. With the likes of Alexa Chung and Leandra Medine aka Man Repeller rocking the bandana, you’ve just joined the ‘ultimate fashionista babe’ club! If heels aren’t for you, and you fancy a more casual yet chilled look, this look is definitely for you! I’m obsessed with this silver bomber jacket from Zara. The mixture of red and sliver accents makes this look perfect for a chilled day or night out, when you would rather look cute and be comfortable. Heels aren’t for everyone, especially me! There’s nothing better than a co-ord, whether you decide to rock it separately or together, so for a night out, why don’t you wear it together, pairing it off with these affordable court shoes (that I’m tempted to get) and sliver accessories?! I love this look for a night out on the town or for the ultimate date night look. Absolute showstopper! This look isn’t for the faint hearted, or the girl with a shallow bank account. Despite my inability to buy that gorgeous Versace blazer or Stella McCartney bag, a girl can dream! I absolutely love matching the pink and red colour blocking, whether you’ve got the budget or not to purchase this entire look, it is most definitely a look that can be recreated with high-street items – so fear not, my pink and red lovers! 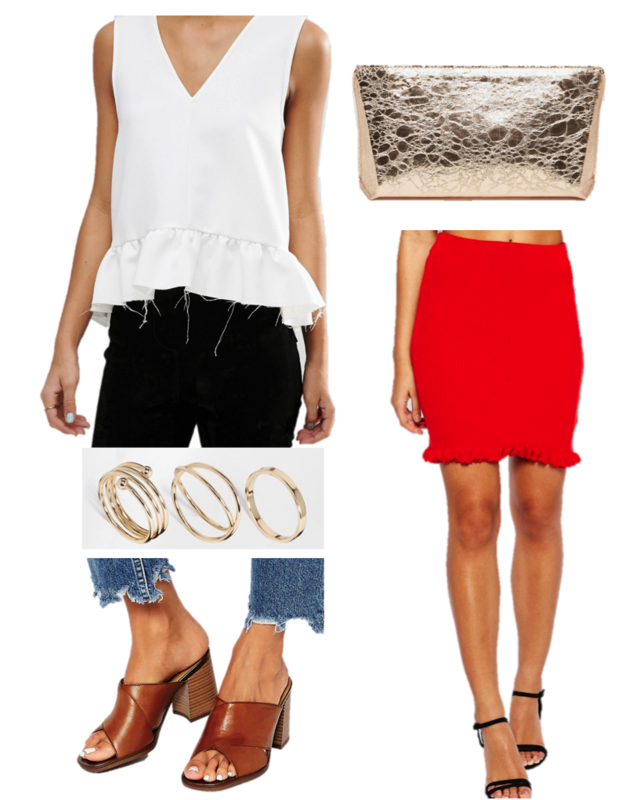 Mules and double ruffles aren’t for everyone, but if you can dare to be brave, this look is a perfect summer 9-5 and after work drinks look. Comment below or tweet me @LaurenNicoleFK which look is your favourite and if you’ll be taking on the challenge.